We are proud to partner with Muraflex™ for Demountable Glass Partitions – the industry’s most aesthetically comprehensive demountable wall solution. Our in-house team will assist you in planning your glass wall project. Our crew of Master Craftsmen have been specially trained to install Muraflex walls, and will meticulously install every square inch resulting in a beautiful, bright, and modern space. Muraflex offers demountable wall solutions fitting everything from a simple loft to large office buildings. Muraflex walls offer the flavor of Europe and the convenience of North America. 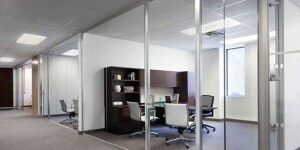 These demountable partitions come in a variety of innovative and aesthetically pleasing materials. It has been described as art meets science, providing a spiritual sense of place, harmonizing in linear form all types of work space activity, creating a legacy that reflects and symbolizes our response to the many challenges which designers are continually faced with. MIMO from Muraflex is not only the most slender and sophisticated demountable wall solution, but also the most versatile, flexible and convenient. Made from fully recylable aluminium, frames are available in innumerable colors and finishes and can accept an endless variety of wall materials. FINO by Muraflex is an elegant and sophisticated demountable wall system whose design was inspired by the word FINO itself, which means thin in Italian. FINO’s narrow profiles and carefully engineered concealed hardware allows for a maximum glazed surface.